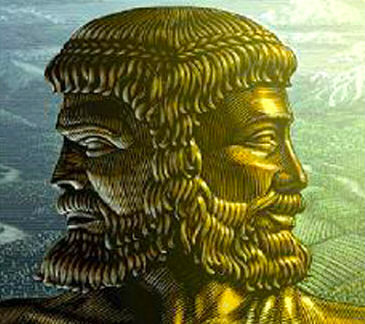 I feel a bit like Janus today. He was the Roman god of transitions; usually depicted with two faces, one looking forward and one looking back, Janus stands at the crossroads of our lives, guiding our passages from where we are to where we shall be. Today, I look back on what, in 2015, becomes two decades of private practice, and where I will be going in the future. So for a moment or two, Janus I shall be. 2014 was a year full of new beginnings for me, both personally and professionally. I’ve made a great many new friends, and enjoyed a renewal of both intellect and spirit. It was also the year I rediscovered my voice, as my writing -- once my career -- has again begun to flourish, not only publishing on my blog, but also at other sites such as the Good Men Project. My book has been resurrected, and is finally making steady progress. The Center for Alternative Medicine, my practice in Litchfield, also saw an incredible amount of expansion in 2014. I introduced my private line of supplements for general health, assisting people with chronic diseases, and to support mental health issues such as anxiety and depression. This, along with my ability to create custom herbal formulas for patients, has fulfilled a life-long dream of mine; the ability to incorporate my knowledge, not only into the recommendation or use of herbs and nutrition, but in their creation. This is a wonderful capability that will benefit all of my patients, regardless of whether they are seeing me for physical injuries or internal disorders. I am the only doctor in Connecticut, to my knowledge, that has ability to offer both of these services. It has taken years of education and experience to reach this point, and my heartfelt thanks goes to all of those people who have helped me get here. Growth occurred internally, as well. Over the course of this past year, I went from having a single employee to three employees. Though most of my patients don’t see anyone except the person at the front desk, behind the scenes I now have people handling the medical billing as well as bookkeeping and accounts receivable. This rapid growth also had me working hard on administrative issues, developing the policies and procedures that never had to exist before. The front desk is now in the capable hands of Giselle, whose laughter is infectious and whose efficiency is becoming legendary. The steely-eyed Joanne is facing off with the insurance companies, making sure that they live up to the promises they made to you, my patients. And Thanhien, who has managed million-dollar payrolls in her sleep, is making sure that our cash flow runs evenly. I could not ask for more capable hands to assist me. As if those weren’t changes enough, I have an ambitious program outlined for the next year, with some entirely new services. In December, I passed the examination to become a federally certified Medical Examiner, and am now one of only a handful of doctors in Connecticut who offer the medical examinations required every two years for everyone who carries a commercial drivers license. I really enjoy doing these exams, as I get to explore with drivers the wide range of health issues that effect them. I have already uncovered a few serious illnesses during the course of my exam, and helped drivers find appropriate care for them. I also now have a CLIA-certified laboratory on site, and in partnership with a couple of other laboratories, we can now provide a comprehensive suite of employment and forensic testing services. I now have the ability to provide breath, urine and hair analysis for drugs of abuse, for everything from alcohol to opiates. When these test results are required for evidence in court, I have the ability to provide what is called “chain of custody” handling, which means that the sample is overseen from collection to analysis, virtually eliminating the possibility of intentional or accidental tampering. I can also provide a full range of relational DNA testing, including gestational paternal testing. This means that, with a couple of blood samples, I can determine the father of a child even before it has been born, with 99% accuracy. I can also perform non-invasive parental DNA tests, as well as testing for multiple siblings. My DNA testing, like the drug testing, can be done with chain-of-custody handling for the court or other agencies, or even to support immigration and citizenship claims. The best thing is that I am making all of these services as affordable as possible for the average person. Anyone who has picked up a paper in the past few years knows that medical services and products are incredibly expensive and have a huge markup. This is, in part, due to the inefficiencies of the medical system, with huge amounts of overhead. I, on the other hand, have been a sole practitioner for decades. I know how to keep my overhead low, and as a result, I can offer these services more conveniently and at less cost than anyone else. Ok, so is that the crop? Let me think...private line nutrition, custom herbs, new staff, DOT exams, drug testing, DNA...yep, I think I covered all the bases. I want to thank every single one of you who helped make 2014 the incredible year it was. My patients, my friends new and old, and my family have given me so much for which I am grateful. I can only hope that I have given back in equal measure. I wish for all of you the most wonderful year to come. Newer PostBeing up front about things. Older PostAre You Ready for a REAL Detox?